This year, I ran Napa Valley Marathon in March. That was my second full marathon. The course was net downhill, and it was rather harsh to the legs, and I started to feel a minor pain in the hip joint soon after. So, I completely stopped doing any exercises that gives high impacts to my legs. 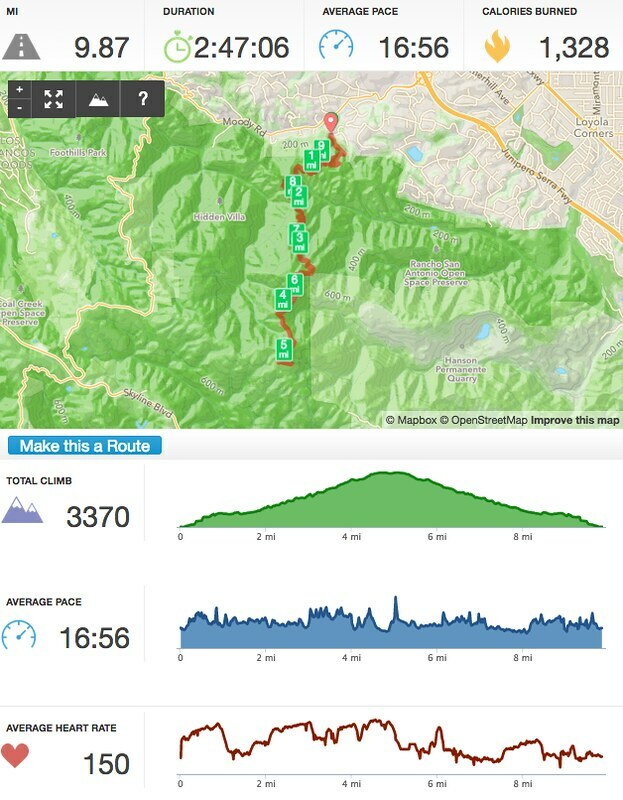 That was the time I started to hike Black Mountain Trail in Los Altos Hills. I gradually extended the course, and soon reached to Black Mountain summit (Elevation 2812 feet). The distance from the tail head at Rhus Ridge road is about 5 miles, and total climb is about 3400 feet. It is just 15 minutes drive from my home, and this 10 mile course makes a very nice weekly exercise for me. Now my joints are healed, and I started to mix trail-run in this hiking activity. What I currently do is to run the fist, third, and fifth miles, and hike the rest for the climbing, and do the same when going back down. The first mile includes 1100 feet climb, and the last mile around the summit is also quite steep. So, I am running very slowly to keep my pace consistent. My first goal is to be able to run all the way to the summit, and gradually challenge on the pace. I love intensive exercises like long-distance running and trail-running. I feel as if physical stress squeezes mental stress out of my system with the perspiration. I also love just to hike at an easy pace. I give my mind a chance to swim into thoughts, or reflect on the past weeks, months, and years of my life. So, I will keep some portion of the returning way dedicated to walking. I like the tranquility at the summit. Early in the morning, around the summit is typically foggy as in the video, and it is fantastical. The fog clears later in the day, and the view from the top is very nice. During the week, I'm caught in the day-to-day hustles, so it is nice to give myself literally a birds-eye view of the world (or Silicon Valley) down there. It brings myself back to the right perspective.